Man, 36 years old, father of two disappears, compounded by the tendency to over dramatize, vanishes without a trace. Now, if you just spent three days on a fishing vacation, unbeknownst to your wife, what would you tell her? "Honey, you'll never believe this, but I was abducted by aliens and Elvis was at the helm of the space ship." Recently, as a result of genuine curiosity, I met with UFOlogist Michel Deschamps. Mr. Deschamps immediately impressed me with not only the knowledge and proof he possessed, but also the conviction with which he spoke. Deschamps is titled as the Provincial Section Director for the Sudbury District. His duties entail the compilation of all UFO incidents into report form. These reports are then transferred to the Mutual UFO Network Inc. (MUFON) located in Texas. This network establishes a framework through its database which permits the accessibility of UFO information retrieval. Mr. Deschamps will be the first to admit that there is truth to these circles, but a great number of hoaxes have been perpetuated by phony circle rakers (stupid phony circle rakers, at that!) Deschamps has in fact witnessed these mysterious circle formations first hand. 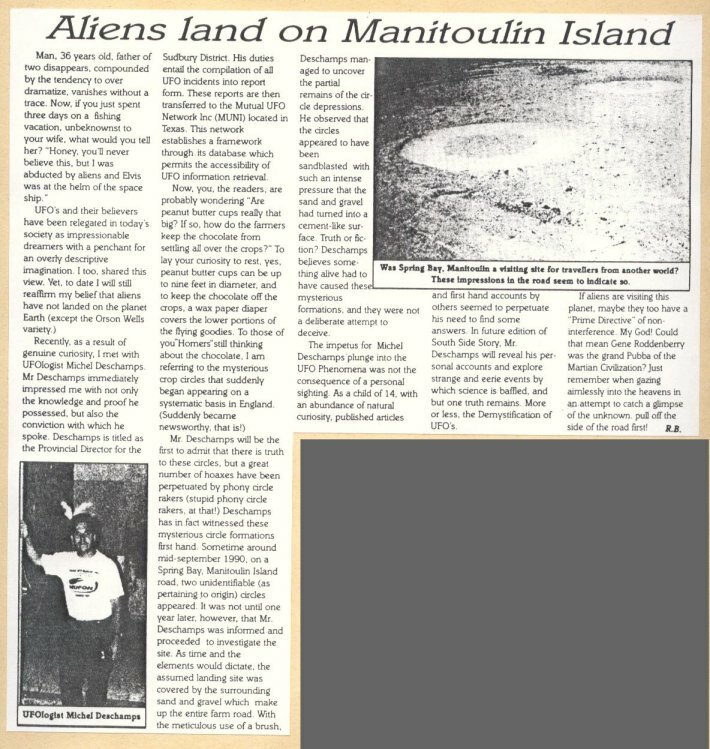 Sometime around mid-September 1990, on a Spring Bay, Manitoulin Island road, two unidentifiable (as pertaining to origin) circles appeared. It was not until one year later, however, that Mr. Deschamps was informed and proceeded to investigate the site. As time and the elements would dictate, the assumed landing site was covered by the surrounding sand and gravel which make up the entire farm road. With the meticulous use of a brush, Deschamps managed to uncover the partial remains of the circle depressions. He observed that the circles appeared to have been sandblasted with such an intense pressure that the sand and gravel had turned into a cement-like surface. Truth of fiction? Deschamps believes something alive had to have caused these mysterious formations, and they were not a deliberate attempt to deceive. The impetus for Michel Deschamps' plunge into the UFO Phenomena was not the consequence of a personal sighting. As a child of 14, with an abundance of natural curiosity, published articles and first hand accounts by others seemed to perpetuate his need to find some answers. In future edition of South Side Story, Mr. Deschamps will reveal his personal accounts and explore strange and eerie events by which science is baffled, and but one truth remains. More or less, the Demystification of UFO's. If aliens are visiting this planet, maybe they too have a "Prime Directive" of non-interference. My God! Could that mean Gene Roddenberry was the grand Pubba of the Martian Civilization? Just remember when gazing aimlessly into the heavens in an attempt to catch a glimpse of the unknown, pull off the side of the road first!